The good people at London agency Mint Digital are never short of ideas, and their latest has a really good cause at its heart. Ladyblabla (points awarded for the silly name) is a UK price comparison site for smartphones, offering tools to help you find a good deal that suits you and then sending you off to a retailer to make your purchase. Not that unusual, you might think, but Mint is running this as a charitable project. So, the commission it’s paid from each successful referral goes to fight mother-to-baby HIV transmission in southern Africa. Charity Mothers2Mothers trains local HIV-positive mothers to act as mentors to women with newborn babies, helping them reduce the chance of passing HIV to their children by giving them good quality advice. 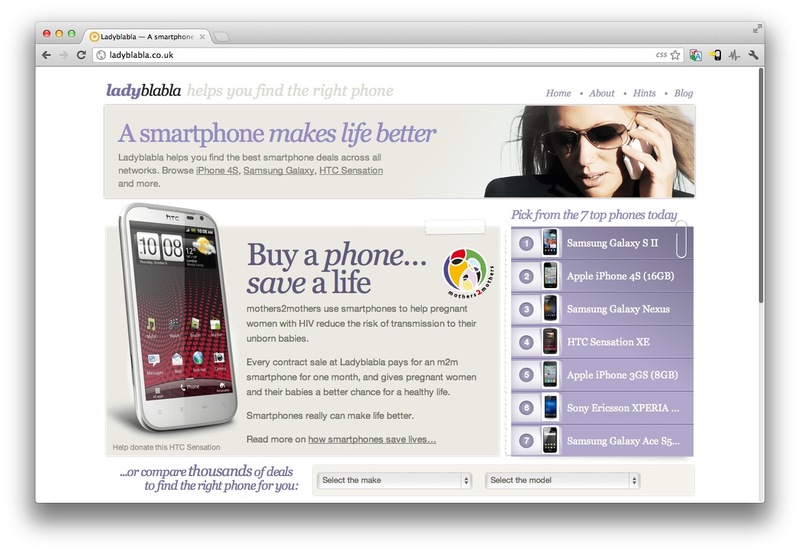 Ladyblabla is a UK-only service right now, but if you’re based there, in the market for a new smartphone and want to do some good for the world along with your purchase, follow the link below and do your bit.